The hotels listed below are situated in the city of Leuven. This list contains merely suggestions, the organisers have not made special arrangements with any of these hotels concerning the stay of course participants. 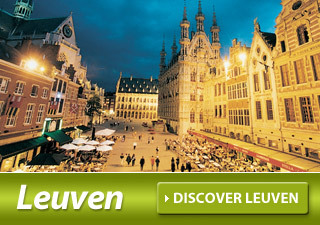 Visit www.leuven.be to see a full list of accommodations. KU Leuven, PMA, Celestijnenlaan 300B, B-3001 Heverlee. To get from Leuven to the campus in Heverlee, take bus nr. 2 (direction Heverlee Campus) or 616 (direction Zaventem) from Leuven railway station. You can also take bus nr. 2 in the city center, along the Bondgenotenlaan and the Naamsestraat. Get off the bus at "Campus Arenberg II" after approx. 20 (when taking bus nr. 2) or 10 (when taking bus nr. 616) minutes. Information about the schedules is available on the website https://www.delijn.be/en/ for bus transport. 10 minutes by bicycle or 20 minutes by bus from course location. 15 minutes by bicycle or 20 minutes by bus from course location. 20 minutes by bicycle or 25 minutes by bus from course location. 1 minute walk from railway and bus station. 20 minutes by bus from railway and bus station. 10 minutes by bicycle or 30 minutes walk from course location. 10 minutes walk or 2 minutes by bus from railway and bus station. 15 minutes by bicycle or bus from course location. This basic accomodation consists in furnished flats, each includes a kitchenette, private bathroom and living area. Ideal for budget-friendly stays (rooms can also be shared) in Leuven. Located next to the Arenberg campus where the courses take place. 15 minutes by bicycle or 20 minutes by bus from centre of leuven.